Bhabua is located at 25.05°N 83.62°E? / 25.05; 83.62. The Buxar district of Bihar State and the Ghazipur district of U.P. State bound it on the North. On the south is the Garhwa district of Jharkhand State and on the West is the Chandauli and Mirjapur districts of the U.P. State. On the East is Rohtas district of Bihar State. Kaimur has an old and interesting history. In pre-historic days the plateau region of the district has been the abode of the aboriginals whose chief representatives now are the Bhars, the Cheros and the Savers. According to some legends, the Kharwar were the original settlers in the hilly tracts of Rohtas. 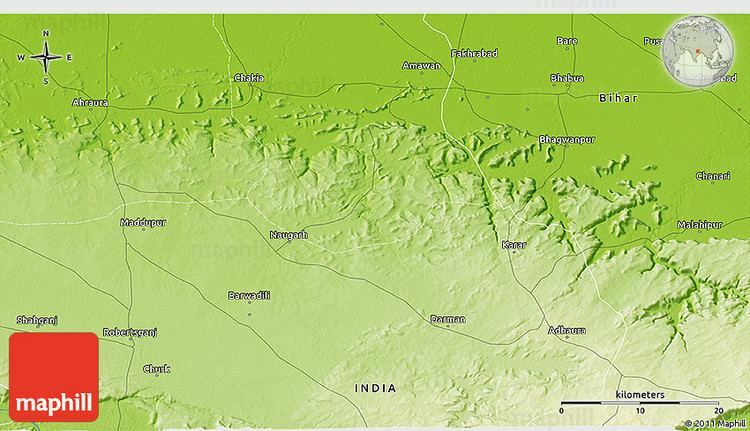 The Ovaons also claim that they ruled over the stretch falling between Rohtas and Patna. One local legend also connects Sasaram the present headquarters of Rohtas with king Sahasrarjun, who was killed by Saint Parshuram in a fight. The district of Kaimur formed part of the mighty Magadh Empire from the 6th century B.C. to the 5th century A.D., under the Mauryan and Gupta rulers of Magadh. In the 7th century A.D., this district came under the control of Harshawardhan, the ruler of Kannouj. An inscription in the Mundeshwari temple near Bhabua refers to the King Udaysena as the ruling chief of the area. The Seal of king Sasanka of Guada in Bengal is inscribed at Rohtasgarh in the district of Rohtas. The famous Chinese pilgrim Huen- tang, who journeyed through the country in the 7th century A.D., passed through Arrah, the headquarters of the old Shahabad district through this region of newly formed Kaimur district. The area of the district successively came under the rulers of Shail dynasty of central India and Pal dynasty of Bengal. According to C. Mark, a historian, the first ruler of Pal dynasty controlled this region. 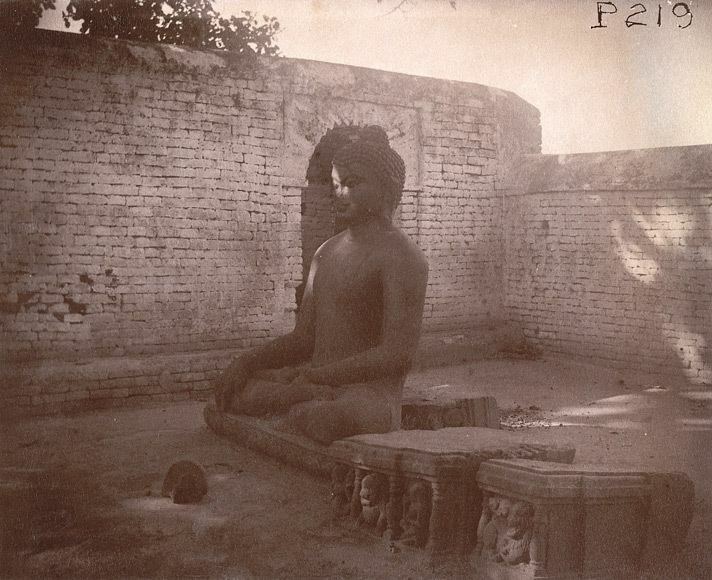 Later on Chandauli controlled Varanasi-Chandawali and also the Kaimur district in the 12th century, as confirmed by the Tarachandi inscription near Sasaram. After the fall of the Guptas the district in all probability relapsed into the hands of the aboriginal tribes and came under the control of petty chieftains. The Rajputs who came from Ujjain, and the province of Mallwa had a series of conflicts with the aboriginals and it took them many hundred years to subdue the aboriginal completely. The Census report of 1961 describes that when Bakhtiar Khiliji attacked Bihar in 1193 A.D., he found Shahabad in the hands of petty Rajput chiefs often fighting among themselves. They were not united and strong enough to offer powerful resistance to the Muslim invaders. Hence Bakhtiyar Khiliji had an easy victory over them and the district soon became a part of his kingdom. Later it was annexed, along with the rest of Bihar, to the kingdom of Jaunpur. A hundred years later, it passed under the direct control of the Muslim empire of Delhi. Sher Shahs father, Hassan Khan Sur, got the Jagir of Sasaram. Later Baler invaded the area in 1529 and has mentioned Hindu superstitions about river Karmanasha. In 1537 the old Shahabad district witnessed advancement of Humayun and his subsequent conflict with Sher Shah at Chausa. Later the district of Shahabad (which includes present Kaimur district also) was included in Akbars empire. In 1758, Shah Alam during his conflict with Lord Clive of East India Company, went to Durgawati and with the help of local Zamindar Pahalwan Singh crossed the Karmanasha River. Subsequently Pahalwan Singh succumbed to comply and live on the latters terms. 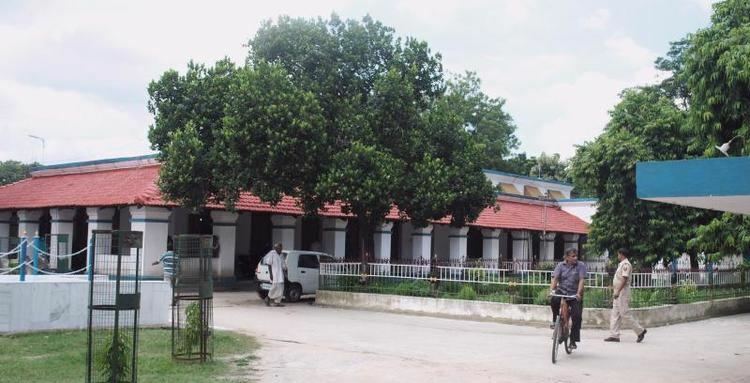 In 1764, the old Shahabad district witnessed conflict for supremacy and the English became absolute masters of the area after defeating Siraj-ud-daula in the battle of Buxar. Again the area was shaken by the rebellion of Raja Chait Singh of Banaras but eventually the English succeeded in suppressing the revolt. Lastly the historic 1857 mutiny under command of Kunwar Singh had its impact in the district. As a result, during the independence movement the district had a substantial contribution to the freedom of India. Much after independence in the year 1972 Rohtas district was formed out of the old Shahabad district and in the year 1991. The present Kaimur district was formed out of the Rohtas district.